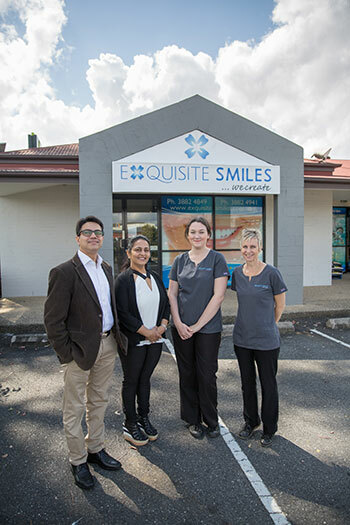 Exquisite Smiles was established in April 2015 by Dentist Dr Rajeev Bhandare and his wife Jigna, our Practice Manager. We’re joined by a team of friendly, qualified and professional support staff. We are passionate about helping our patients in the Warner and surrounding areas have a beautiful, healthy smile. We’re focused on your needs, putting our patients’ best interest as our highest priority. Rajeev has been in practice since 1998 and understands that many people have felt apprehension in the past when visiting the dentist. We see all ages, from children and their parents to senior citizens. A variety of solutions is available to you, including sleep dentistry and dental implants to complement our range of general dentistry services. We’re centrally located in Warner, next to Brodies in the Market Place Shopping Centre complex. You can easily reach our practice by bus, and we offer a large car park for your convenience. Our modern practice offers accessibility for patients in wheelchairs or with limited mobility. We put our patients first at Exquisite Smiles and will tailor a dental treatment plan to suit your individual needs and budget. We offer payment plans and can complete insurance claims instantly with on the spot HICAPS processing. Book your time with our caring, friendly team today!